White House communications director Anthony Scaramucci responded this evening to an article detailing an expletive-ridden phone conversation New Yorker reporter Ryan Lizza says he had with Scaramucci wherein he criticized key members of the Trump administration's senior staff. “I sometimes use colorful language. I will refrain in this arena but not give up the passionate fight for @realDonaldTrump's agenda. #MAGA,” Scaramucci said in a tweet this evening after the article posted. He later added, appearing to blame Lizza for publishing the exchange, "I made a mistake in trusting in a reporter. It won't happen again." Scaramucci was responding to an article posted on The New Yorker’s website (warning: this article contains offensive language), in which Lizza detailed the call that Lizza says the two had about Scaramucci’s hunt for leakers within the administration and his frustration with certain key members of the Trump administration, including Chief of Staff Reince Priebus and Chief Strategist Steve Bannon. At another, Scaramucci used a vulgar phrase describing how he alleges Priebus prevented him from becoming a part of the administration in the first six months. Lizza told CNN this evening that he spoke with Scaramucci again today and cleared it with him that his comments Wednesday night were in fact on the record. 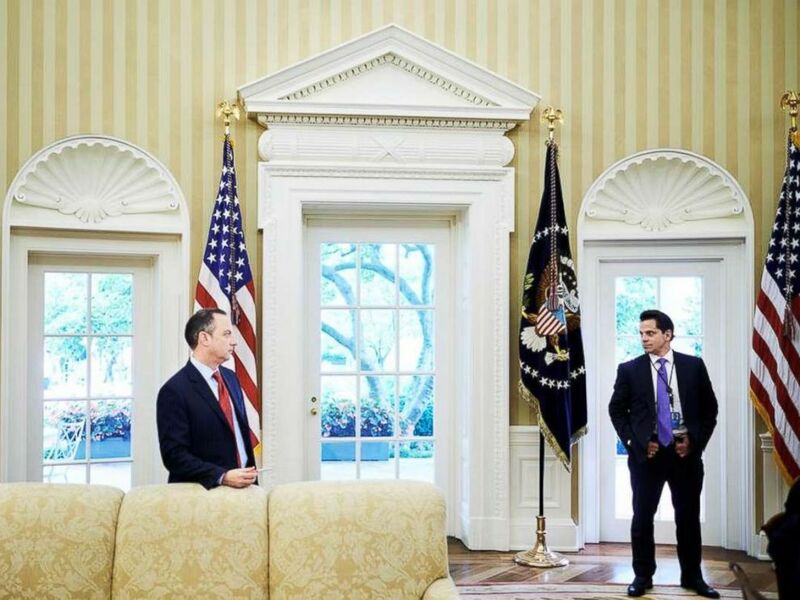 Reince Priebus, the Chief of Staff, and White House Communications Director Anthony Scaramucci in the Oval Office on July 27, 2017. The article states that the reported Wednesday evening call came after Lizza had tweeted that a senior White House official had told him about a group dinner that had occurred at the White House that night. Lizza reported that President Donald Trump, first lady Melania Trump, former Fox News executive Bill Shine and Fox News host Sean Hannity were at the dinner. Scaramucci wanted to know who gave that information to Lizza, and threatened to fire people as a result, according to the article. Lizza would not reveal his source. "They’ll all be fired by me. I fired one guy the other day. I have three to four people I’ll fire tomorrow. I’ll get to the person who leaked that to you. Reince Priebus -- if you want to leak something -- he’ll be asked to resign very shortly," Scaramucci said, the article states. Speaking to Fox News Thursday evening, incoming White House press secretary Sarah Sanders said that Scaramucci is a "guy who sometimes uses colorful and in many circles probably not appropriate language." “He's very passionate about the president and the president's agenda, and I think he may let that get the best of him in that conversation,” she added. The conversation with Lizza comes in stark contrast to Scaramucci's first public comments in his new role. At his first White House press briefing on July 21, he praised both Priebus and Bannon. He called Priebus "a dear friend" and noted that they've "spent many times together socially." "Reince and I have been personal friends for six years. We are a little bit like brothers where we rough each other up once in a while, which is totally normal for brothers," Scaramucci said. As for Bannon, he said, "I think he’s one of the smartest people that I know," and added that he has "a huge, enormous amount of respect for him." "I want to work with Stephen Bannon as closely as I possibly can," Scaramucci said at the briefing.